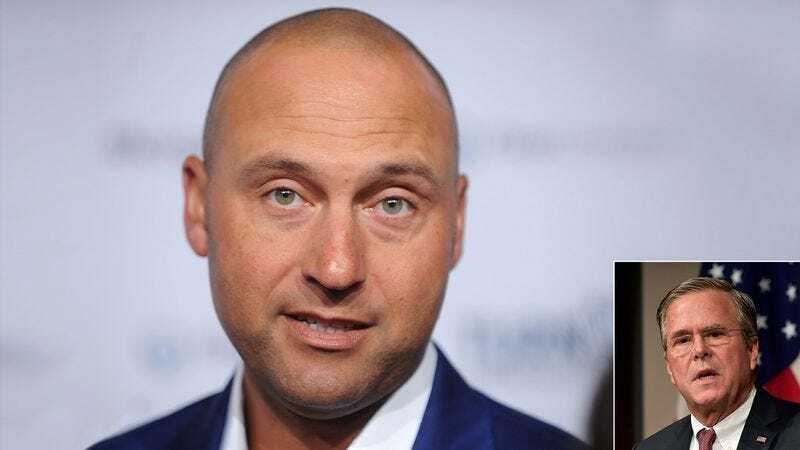 TAMPA, FL—Saying that sitting in the same boardroom together still feels completely surreal, former Yankees shortstop Derek Jeter told reporters Thursday that he had finally fulfilled a lifelong dream of starting a business venture with Jeb Bush. “Ever since I was a little kid, all I’ve wanted to do is become equity partners with Mr. Bush,” said the former New York Yankees All-Star, adding that he was first inspired to become a businessman as a child while watching Bush’s entrepreneurial strides in the Latin American banking sphere and his work on his father’s presidential campaigns. “I was only 6 or 7 when Jeb made partner at The Codina Group, but his tireless efforts in securing tenants for commercial developments made me dream of one day recruiting outside investors for our own joint ownership team. I used to stare at the poster of him in my bedroom for hours just imagining us securing a billionaire dollar deal together. I’m still waiting for somebody to wake me up and tell me this is all just a dream.” Jeter also said that the partnership made spending more than two decades working as a professional baseball player completely worth it.